This role grants basic Request and Claim access (See Expense User settings in the web config). This role grants access to expense user reports. This role grants access to the booking queue for expense users. This role grants access to basic credit card import features such as bulk import for the user’s own account. This role grants access to advanced credit card import features such as bulk import for all accounts (including the user’s own account). Do not modify. This role indicates that the user has the ability to override the GL Account Allocation on an expense claim or request. This role is controlled from the Expense User tab, as outlined below and should not be manually changed. The Expense User Tab on the employee user details screen allows for Expense User functionality to be enabled and configured, as described below. 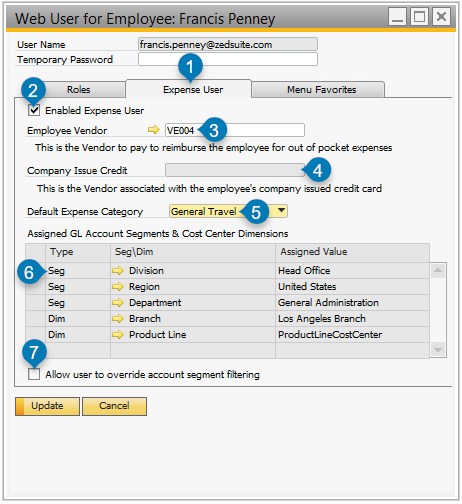 Employee user Expense User section. Fill in these fields only if the Employee requires access to Expense User features. Must be checked for this user to access Expense features in Employee Portal. Checking-off this box automatically assigns an Expense User per-user license to this user. If a per-user license is not available, then the check-box will not be saved and a license will not be assigned. Defines a Vendor Business Partner Card Code that will be paid when reimbursing employees for out-of-pocket expenses. If a vendor does not already exist, one can be created an assigned to the Expense User. The user’s assigned Vendor will be saved on the expense PO detail lines. Optional. Defines the Vendor Card Code that will be associated with the employee’s company-issued credit card, if applicable. This is required only if company-issued credit cards are enabled. This vendor will be saved on the expense PO detail lines. This option sets the user’s default Expense Type Category which will be pre-selected when the user creates a new Expense Request or Expense Claim. The user may select another category on the request-level/claim-level or they may change category on the detail-level. This option determines which expense types show up by default when the user first creates the request or claim. This section is used to configure user-level advanced GL Account Segment or Dimension settings. Configuration is only necessary if the advanced GL Account determination features are enabled, as described by GL Mapping Configuration. If checked, this allows users to manually override their GL Account assignments for expense detail lines. Checking this option automatically adds the necessary role (GL Override) to the user, which grants the user access to this feature. Note that if no valid GL Allocation exists for a user’s selected expense detail, then that user will be able to override the GL Allocation even if this option is not enabled. This is because all expense details must have an assigned GL Account before they can be submitted. Check off “Enabled Expense User” to enable expense features and assign a named user license. Assign an Employee Vendor which will be assigned to the user’s expense POs to reimburse the employee. If applicable, assign a Company Issue Credit vendor, which will be assigned to expense POs that are marked as Company Paid. Select a default Expense Category. This will determine which Expense Types are displayed by default when the user creates a new Expense Request or Expense Claim. If applicable, configure Assigned GL Account Segments & Cost Center Dimensions. See GL Mapping Configuration for more information about GL Allocation. If applicable, allow the user to override account segment filtering if they should be able to manually select GL Account allocations for expense details. Note that if this is disabled, the user will still be able to manually select GL Allocations where default settings result in an invalid selection.